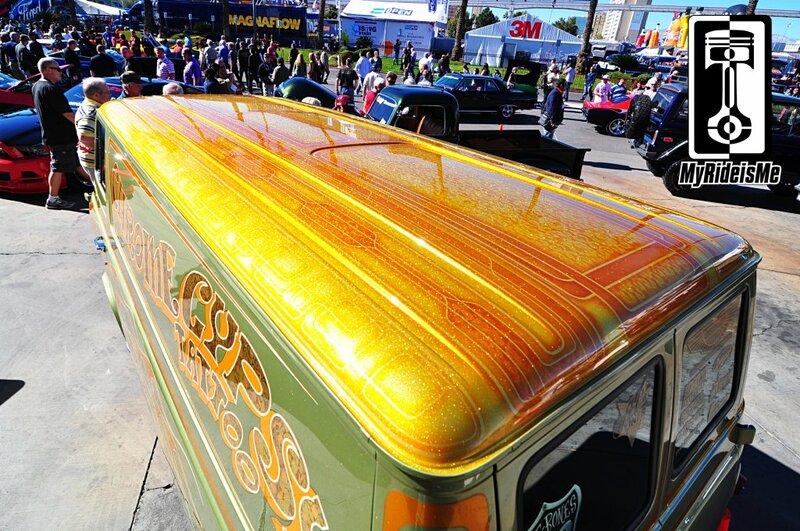 One of my EASY picks for “Favorite at SEMA” has to be this custom Ford Econoline Van. Not since Church’s VanGO has a van made a statement like this. With metal flake shining in the Las Vegas sun, I had to grab some pictures and share. If metal flake’s your thing, make sure to look at the other metal flake paint stories and pictures we’ve done including a “how-to” about spraying flake yourself. 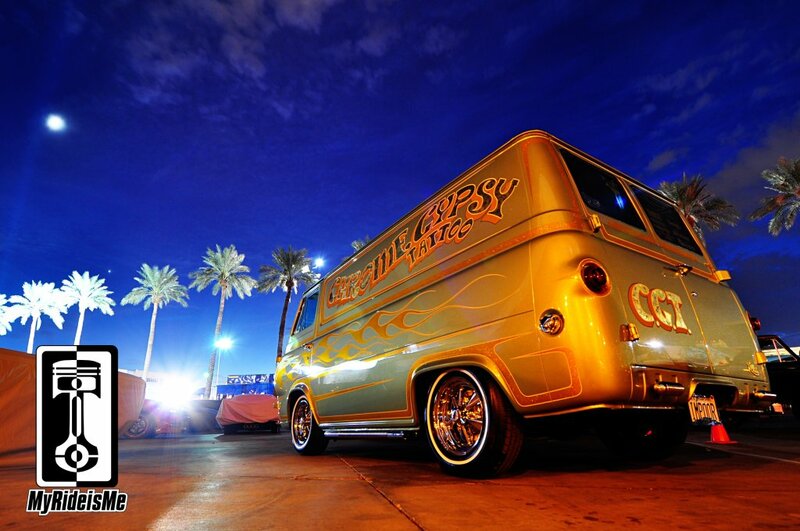 Complimenting the cooper-gold flaked flames and stripes, the gold leaf lettering spelled “Chrome Gypsy Tattoo” a Las Vegas based tattoo and piercing shop. A perfect calling card for the shop, yea?? How do you paint metal flake on a roof with this detail? Standing on a latter for days!!?? Someone lets us know who did the paint… they deserve credit! 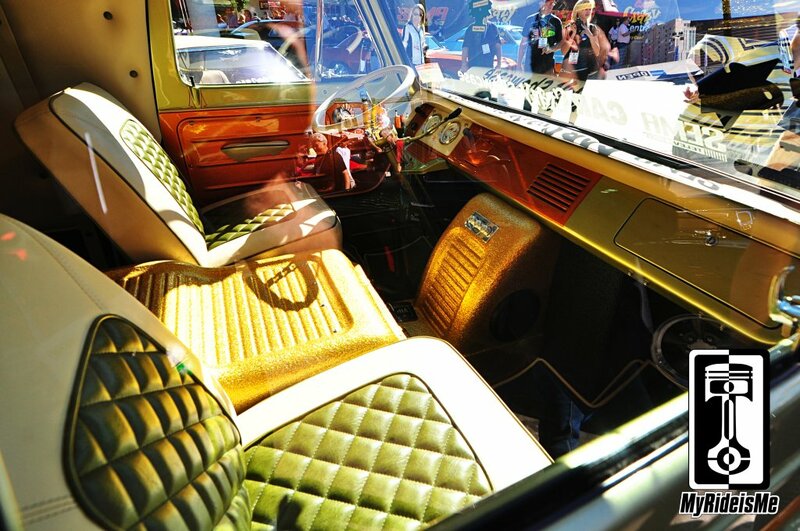 Custom details and more metal flake covered the interior. I heard the engine’s detailed and flaked too. I’ll try to grab a picture tomorrow. Before I left SEMA today, I had to try for a few night shot! With my camera carefully positioned on my backback, here’s what I got thanks to about a 6 second exposure. See the light pointing straight up in the corner? That’s the Luxor Casino. Here’s one more. 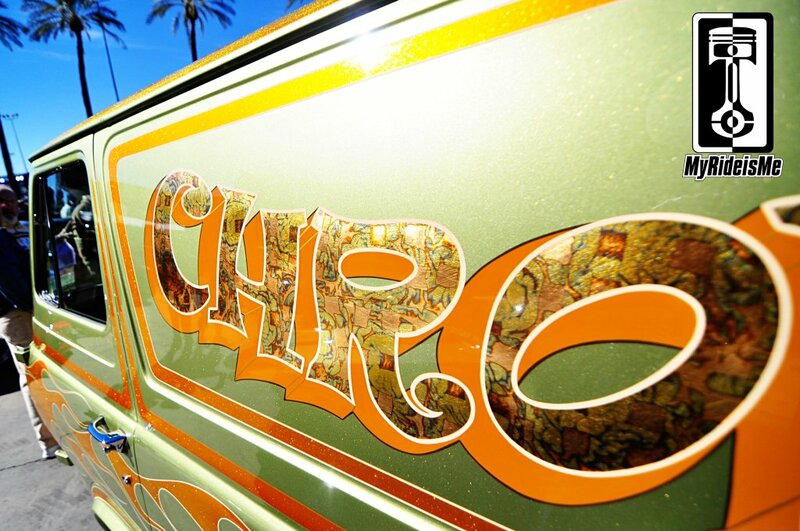 Even though it was almost completely dark, the sky added some fine details to an over-the-top, cool as hell van! Hopefully I’ll catch the owner tomorrow. Until then, if you know anything about this van, leave a comment below. I’ll add details here as I get’m. Thanks!! I had a Ford van , same year … But not that cool . They put a a lot of time in the baby. Great shots, this is a tough one to get right with all the different colors. 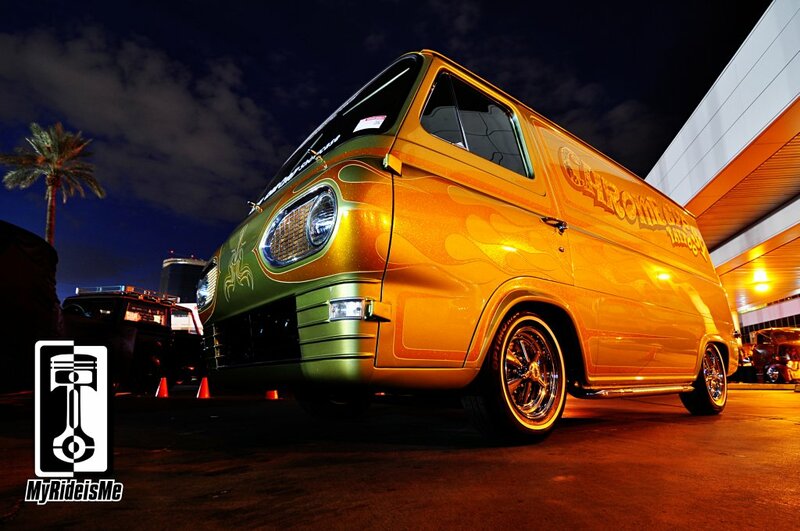 The night shot is the best I’ve seen from all the shots taken of this van by everyone at SEMA. Keep up the great work, hope to meet you one of these days. 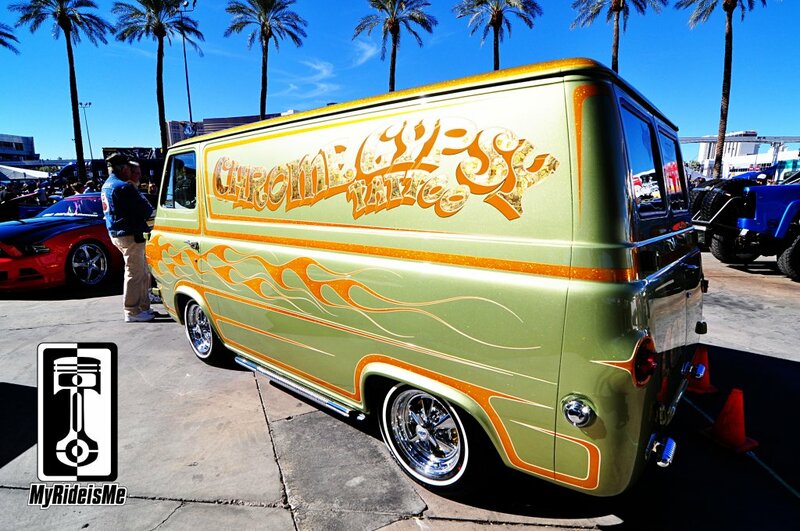 The van’s Owner is named Cleen Rock One and he owns Chrome Gypsy Tattoo in Las Vegas. 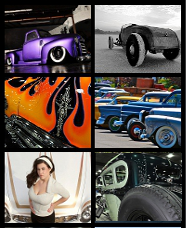 He is a member of the BareBones CC and friends with the fabricator who is building my 29 Model A roadster. WE’ve correspnded via Vinvanco on FB, I started it just over a year ago. Send me you address and t-shirt size and I’ll send you a t-shirt. Hope life is treating you right.